Download an Excel spreadsheet of this information, or an Acrobat (pdf) version. Willow Bend - Plano, TX - (Aug. 3) - indoor mall. 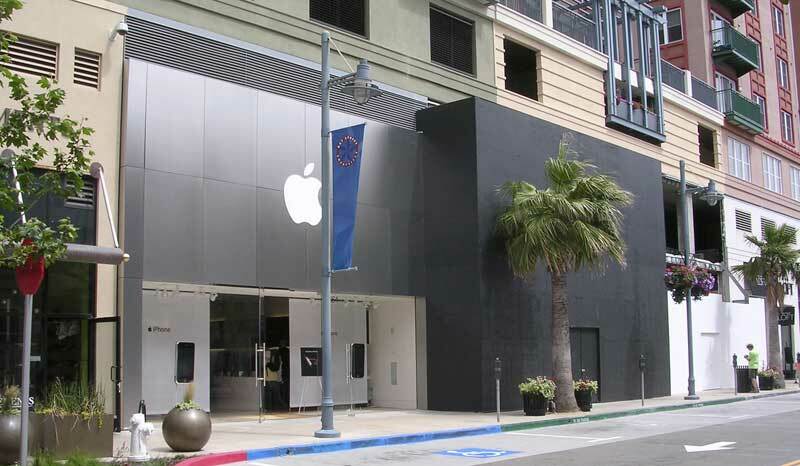 In mid-2006 the theater was removed, and the Genius Bar was moved to take its place and upgraded to five positions. Northridge (Mall) - Northridge, CA - (Oct. 13) - indoor mall. Renovated May 18-29, 2009. Westfarms - Farmington, CT - (Oct. 27) - indoor mall. Closed May 18 - June 4, 2009 for extensive renovation to latest interior design, including remove front POS, replace original white Corian kidneys and black shelving, install wall product shelving, replace wood floor, install One to One training table. Tice's Corner - Woodcliff Lake, NJ - (Nov. 3) - outdoor strip shopping center with 20 stores, and a "Main St." theme. 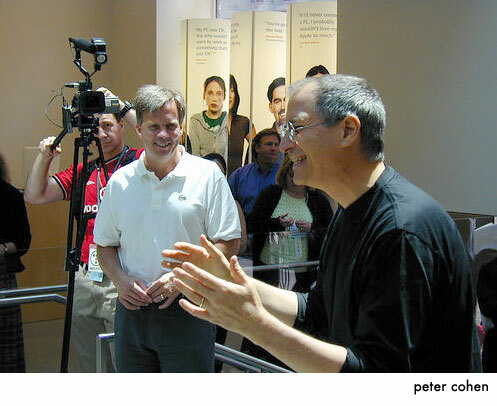 In late 2006 construction will start to remove the store's theater, enlarge the Genius Bar and install a Creative Bar. Kenwood Towne Centre - Cincinnati, OH - (Nov. 3) - indoor mall, 6,500 square feet. Closed June 1-11, 2009 for renovation, including refinishing the wood floor. Aspen Grove - Littleton, CO - (Nov. 10) - outdoor strip mall, 6,200 square feet. Renovated April 6-23, 2009. Valley Fair - Santa Clara, CA - (Nov. 23) - indoor mall. "Creative" job position appeared for the store on Aug. 29, 2004, indicating the store will eventually have a "Studio" bar. 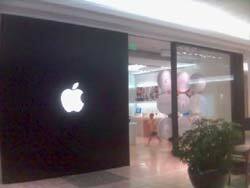 In Sept. 2006 the store was renovated to remove the theater and place the Genius Bar in its place. 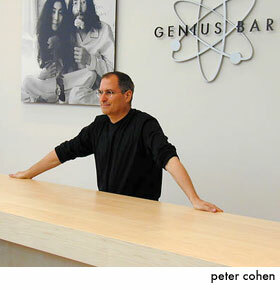 The former Genius Bar is now the Studio bar. The store closed entirely July 16-20, 2007 to create a mini-store, while the full store undergoes renovation and floor plan change. Re-opened Nov. 17th. Clarendon - Arlington, VA - (Dec. 1) - open-air strip mall. Renovated in early 2007 to remove the rear theater, move Genius Bar to rear, and create iPod accessory area at former Genius Bar location. South Coast Plaza - Costa Mesa, CA - (Dec. 1) - indoor mall [photo by Tuan]. Rear theater will be replaced by Studio bar during December 2005. Closed in Oct. 2007 for floor plan change and renovation. Rockingham Park - Salem, NH - (Dec. 8) - indoor mall. 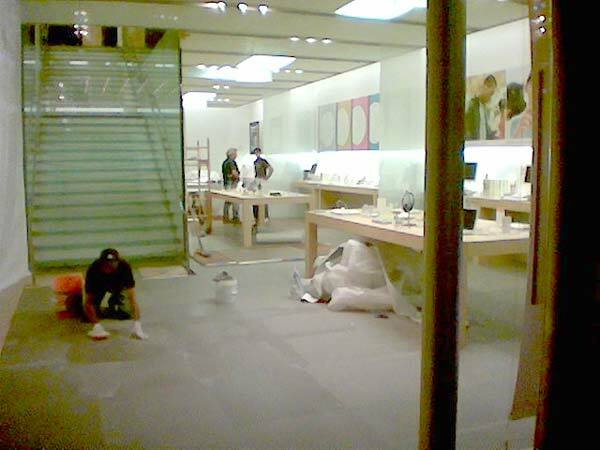 In mid-2006 the store underwent a rennovation: new stone floor, removed the rear theater and replaced it with an expanded Genius Bar. The former Genius Bar is now iPod accessories and laptop cases. The store closed for a week in early April 2009 for a second renovation. 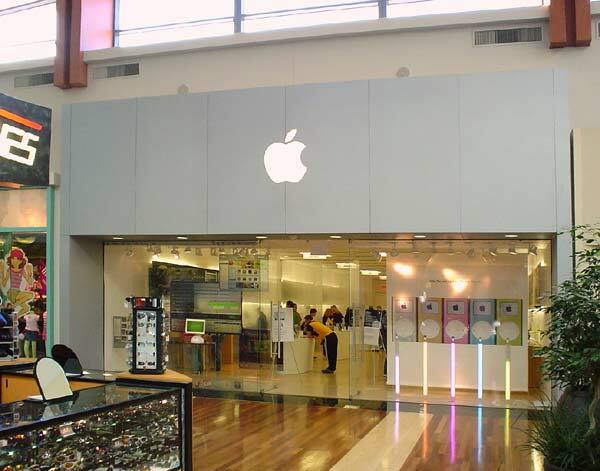 Cambridgeside - Cambridge, MA - (Dec. 15) - indoor mall - Underwent conversion from rear theater to rear Genius Bar in Sept. 2006. Underwent renovations May 10-21, 2009 to remove front POS, Corian display tables and black-painted shelving, and to install current-version furnishings. The Street at Southpoint - Durham, NC - (March 9) - store located in the outdoor expansion area of the indoor mall; unusual two-tone, red-brick storefront. Simon and Kieran first in line. Grand opening T-shirt sold Aug. 1, 2004 for a record-setting $200 on eBay. Close April 12-24, 2009 for renovation. Biltmore (Fashion Park) - Phoenix, AZ - (March 30) - uncovered mall, Dan and Jessica (Denver) were FIL at 6 a.m. In July, 2008 construction next door raised speculation of an expansion, with a re-openign date of Sept. 6th. Lenox Square - Atlanta, GA - (May 11) - indoor mall with 200 shops with 1.4 million square-feet of retail space. The mall is lated for a 35,000 s.f. expansion consisting of a second level, to open in the Fall 2007. Apple will reportedly occupy some of that space with a two-level store. Renovated in March-June, 2007. Wellington Green - Wellington, FL -(Aug. 17) - indoor mall. Closed for renovation June 1-25, 2009. The Westchester - White Plains, NY - (Sept. 7) - indoor mall. In April 2005 construction began to create a much larger 45-foot store, by taking over the adjacent KB Toys and Body Shop spaces, and then closing the current store. The larger store will include a double-sized Genius Bar and a new Studio bar. Larger store opened July 16, 2005. Apple announced the move only through e-mail to local Mac users. Renovation scheduled for April 27-May 9, 2009. Houston Galleria - Houston, TX - (Sept. 21) - indoor mall. Store renovated in March-June, 2007. Towson Town Center - Towson, MD - (Oct. 5) - indoor mall, store is on the 4th level, near Nordstrom's and next to Sharper Image. Millenia - Orlando, FL - (Oct. 19) - indoor mall. Reduced to "mini-store" in early March, 2007 to allow for renovation. Southdale - Edina, MN - (Nov. 2) - indoor mall southwest of Minneapolis. An unlikely city for a store, but it's Sr. V-P Retail Ron Johnson's home town. Menlo Park - Edison, NJ - (Nov. 9) - indoor mall. Closed June 1-25, 2009 for a major renovation, including removing wood floors and glass partitions, and relocate side-mounted Genius Bar. Cherry Creek - Denver, CO - (Nov. 23) - indoor mall, full-size. Oakbrook - Oak Brook, IL - (Nov. 29) - outdoor mall, Mike was first-in-line. Scheduled to be closed Oct. 22 - Nov. 9, 2007 for renovation and floor plan change. Arden Fair - Sacramento, CA - (May 17) - indoor mall, 3,600 square feet previously occupied by the jeweler Bailey, Banks & Biddle. Chestnut Hill - Chestnut Hill, MA - (June 14) - indoor mall. Closed June 10-15, 2007 for floor plan change. Boca Raton - Boca Raton, FL - (July 4) - indoor mall. Closed Nov. 5-16, 2007 for renovation. Short Pump Town Center - Richmond, VA - (Sept. 4) - open-air mall, Jeff & David were FIL at 7 a.m. in a light rain. Closed June 1-11, 2009 for renovation. University Town Center - San Diego, CA - (Oct. 24) - Closed May 14-18, 2007 for floor plan change. Corte Madera - Corte Madera, CA - (Nov. 1) - open-air mall, narrow.